I hope I find you well this morning. It's certainly looking up from an Arsenal point of view. We're back in action within the next 72 hours, so that's something to look forward to. In terms of news from the club, there is very little of that it seems. The players on international duty started returning to London yesterday but there is no word on the official site as to their condition or if they've all returned safely without incident. However from the round-up of how the players got on, it doesn't appear any had to be substituted early because of injury. Hopefully we should hear later today what the state of play is with regards team news heading into the weekend. We've got two important games inside four days, so you would assume that there will be some rotation in the starting 11. One of the players who won't be getting a rest in his current form is Robin van Persie. With the striker scoring 11 goals in 11 games already this season, I don't think Arsene Wenger will prolong the Dutchman's time out of the team. The Arsenal captain missed the Netherlands 3-0 defeat to Germany on Tuesday night after the prior agreement between Wenger and Holland boss Bert van Marwijk that would see the player sent back to London after his country's Friday night game against Switzerland. With a full week to rest and being in fine form, Robin will be Wenger's first name on the team sheet for Saturday's lunchtime kick off at Carrow Road. And as part of the promotional work for his new RVP 100 goals DVD, the striker has been talking about Arsene Wenger's influence on his career. "It was then I started to realise. He gave me a little bit of advice on certain things I was doing. "He told me to think more about my actions. It was a conversation which lasted a year. Every couple of weeks he would refer to that conversation we had. "He was giving me proof as well so I could go on and find my answer and I was finding answers all the time. He helped me big time." It's often been said that the manager doesn't do too much talking in and around the dressing room, allowing his players to reflect on their own performances. He likes players to discover the solutions to their own problems, intellectuals who will analyze their own performance and know where they've gone wrong and correct the issue even before the manager has to say something. With some players it obviously works. With others, they find it odd that the manager isn't ripping into the team after a defeat. I think it's fair to say that Arsene Wenger is pretty unique when it comes to team talks and the preparation of his players. 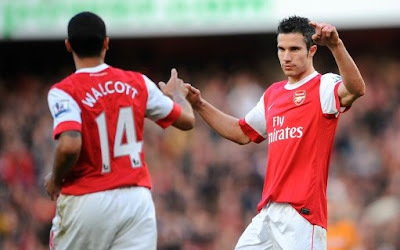 But on the whole it's worked, especially with a player as thoughtful and addicted to football as RVP is. The captain also has some words of praise for Theo Walcott. "After every single goal, people ask me, ‘Who gave the assist?’ I just say, ‘Who do you think?’ We have that connection. I know what he is going to do, which is very important. "It’s vital to have a player around me, as a striker, who knows where I move, how I move, do I want the ball into feet, do I want it behind. He knows where to find me. Stuff like that is vital." It's a shame that in the article they don't give the statistics of goals Walcott has created for van Persie, but I think I'm right in saying that of the assists Walcott has created, the majority have been for van Persie. It's obviously very important to have a good relationship with the players around you and to know their game and because Walcott is an every present in the team he's been able to build up that rapport with van Persie. Whilst Walcott has developed as a player, his all round consistency is still missing. It will be interesting to see what kind of deal the club offer him when they come to sit down to discuss his new contract. For Theo it's really a no brainer in my opinion. If Arsenal offer him a new deal, he should bite our hands off. There has been talk of Chelsea being interested in him, but why would he want to move across London to play in blue? He starts every big game for Arsenal and has a fantastic manager in Arsene Wenger. He's happy and at a club known for developing players to their full potential. He's only 22, so there is still plenty of time. As I say, a no brainer. Ju Young-Park has been talking to the official site and comes across in his interview as a nice guy. What kind of chance he'll get with Robin being in such good form this season really remains to be seen. I'm under the impression that Arsene Wenger will speak to the media later today, or if not the boss will speak to Arsenal Player for their exclusive pre-match interview. So hopefully we'll have some more team news later. And finally if you fancy some extra reading, Joss Bennett takes a look at the development of Andre Santos since his move to the club in the summer.